Donguibogam Village, Sancheong-gun, Friday 6 September, 9am. In the daylight, I am beginning to get my bearings. 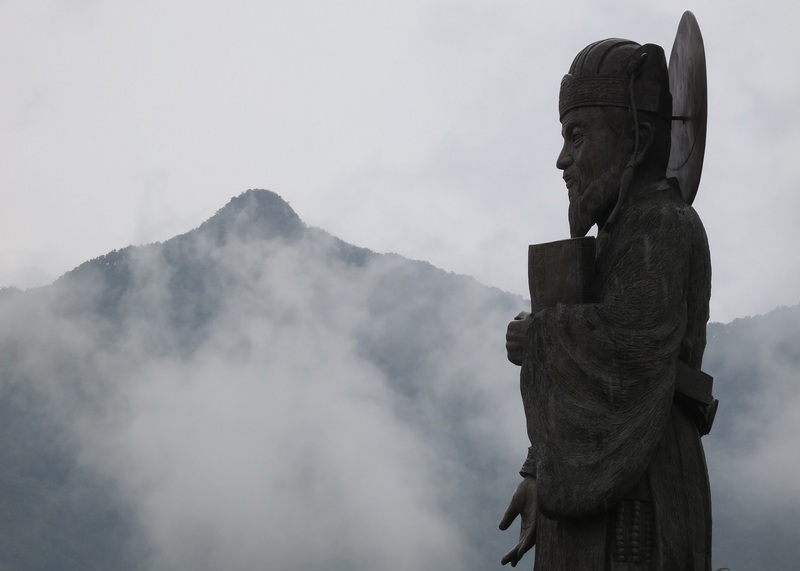 The Sancheong World Traditional Medicine Expo is set in a 109 hectare (269 acre) site dominated by the dramatic peaks of Pilbongsan (pencil-peak mountain) and Wangsan (the King’s mountain). The natural slopes of these mountains establish the geography for the site as a whole, which is known as the Donguibogam Village after Heo Jun’s ground-breaking medical encyclopaedia. But the gradients are even more accentuated than one might expect because much of the site was once a kaolin quarry, which produced high-quality clay for the pottery industry. These slopes have been landscaped and planted with trees; paths and trails have been laid out; on other parts of the hillside which are unwooded there is a large herb garden; museums and halls have been built to exhibit the story of the Donguibogan and other aspects of traditional medicine; at the bottom of the slopes a wide flat area has been created to accommodate a large exhibition area, showground and permanent stage; and a medicinal theme park is dominated by the giant heads of the bear and tiger of the Dangun legend, showing how medicinal herbs have been entwined with Korea’s history ever since its mythical foundation. The choice of location for the expo is deliberate. It is on the slopes of Wangsan (top right of the above map) that the gi of the Baekdu-Daegan is at its strongest: the gi of Korea’s mountain backbone is said to gush southwards from the Taebaek mountains, halt at the south coast, and make an abrupt turn onto the slopes of Wangsan, where it is contained. Gi is the most important element in Korean Traditional Medicine, and the herbs grown in the Jirisan area (which includes Wangsan) are said to be the most potent in all of Korea. Here is that energy which is central to Sancheong, and the gi is concentrated in three special rocks known as the Samseok. I have visited these two of these rocks every year for a top-up of Jirisan energy. The third has only recently been transported there, and it must have required a pretty robust truck to do so. Of these stones, the most prominent and most famous is the one I call the Turtle Rock, because of its shape. Its official name is the Gwigamseok (귀감석 – the Stone Engraved with Virtuous Letters). This is the stone that, more than the others, people touch, almost embrace – getting as much bodily contact with it as possible – to absorb its gi. 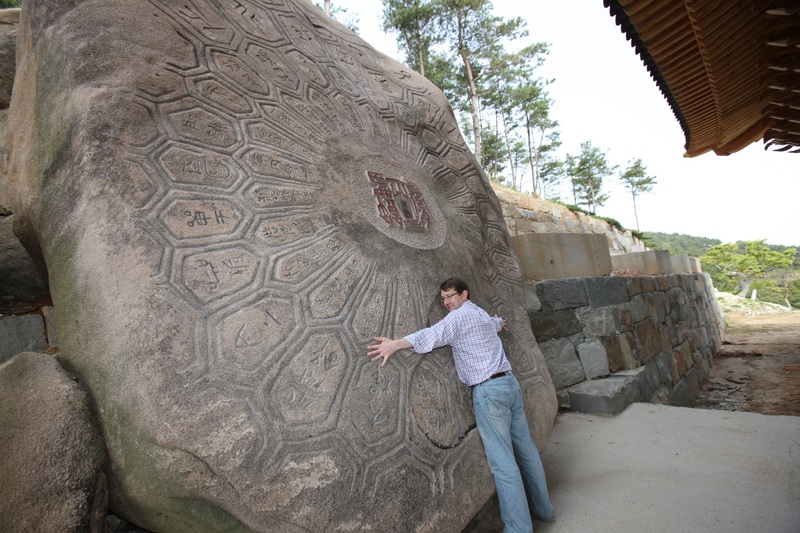 In fact, if you see any of Sancheong’s tourist brochures and notice a photograph of a foreigner spread-eagled against the Turtle Rock trying to maximise the surface area of contact with the rock, thus maximising the gi intake, that’s probably me. The problem is, I find the gi only lasts for the period when I am in Korea. When I get back to the UK I revert to my normal dozy self. On the slopes above the Turtle Rock is the second of the three rocks, the Phoenix Shield. 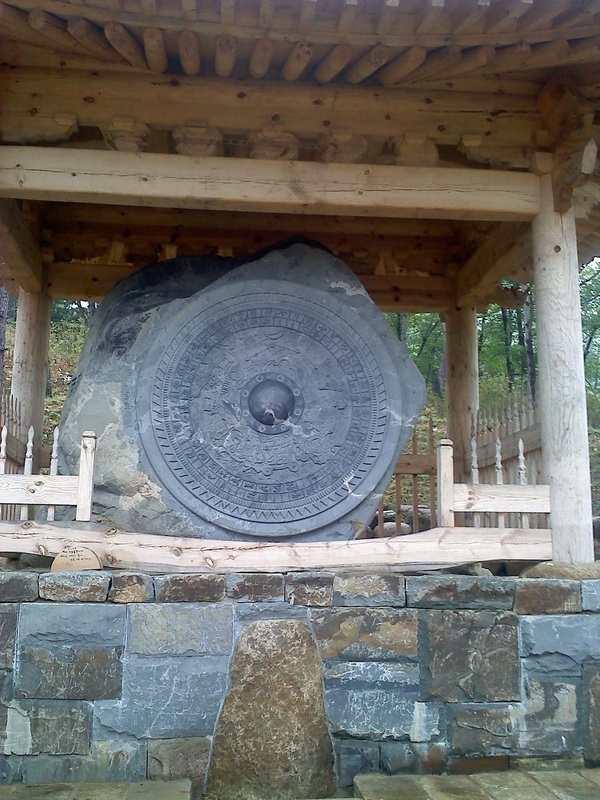 Its official name is the Seokgyeong (석경 – the Stone Mirror) but there is a distinctive phoenix-shaped mark in the shield-shaped stone, which is said spontaneously to have appeared on the day that the Presidential Seal was completed in a nearby workshop. The stone is also said to have health-giving powers: Mr Min, my regular guide in Sancheong, says his bad back improved when he started to visit the Seokgyeong regularly to show his visitors. The first of our ceremonies for the day is to be held in front of the Stone Mirror. The ceremony is a Sanshin-je, the ritual to honour the Mountain Spirit. 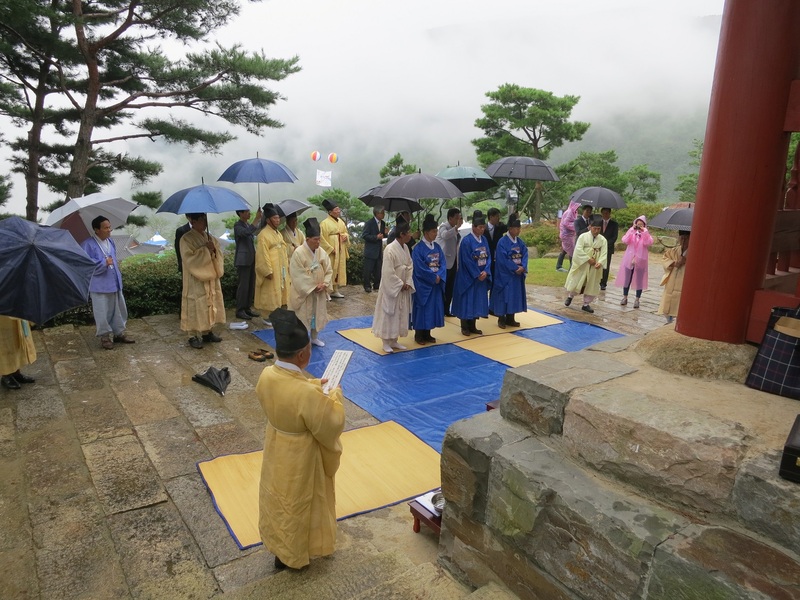 It is an abbreviated version of a much longer and larger ceremony which is held annually on Jirisan’s peak. That ceremony is conducted by the Buddhist monks from Beopgyesa, a temple near the summit, in front of a crowd of maybe a hundred onlookers. This ceremony, conducted by the Mayor and other County officials, is witnessed by only a handful of people, including the official photographer. When we arrive, the officials are already preparing for the time-honoured formalities: among them is the Mayor, together with a member of the Gyeongnam provincial assembly, the heads of the county forestry and cultural departments, and the local police chief bedecked in his medals. 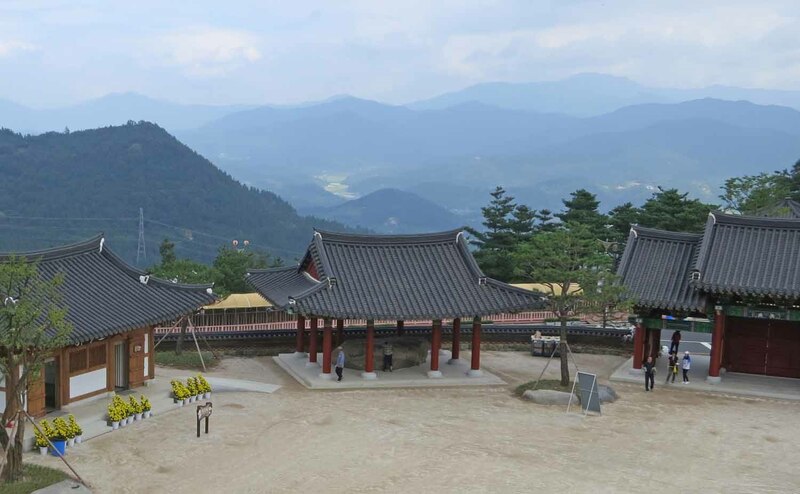 The same ceremony for the mountain spirit is performed every year at this spot before the opening of Sancheong’s herbal medicine festival in early May, and so it is natural to hold a similar ceremony at the beginning of the Expo at which visitors will be coming from much further afield. The officiants are dressed in their ceremonial robes, their besuited attendants protecting them from the rain with umbrellas. The show has to go on regardless of the weather, and the mountain god must be honoured with rice cake, pig’s head, fruits, sesame cakes, jujubes and makgeolli. The ceremony lasts about 20 minutes: instructions and prayers intoned by a celebrant, a goblet of makgeolli placed on the altar by each of the three main officials, the Mayor taking the lead, and the requisite number of solo and communal bows. The ceremony draws to a close as the Mayor takes a first sip of the makgeolli, and bites into a jujube. That is the sign that the ceremony is over, and the invitation for the onlookers to take a sip of the makgeolli and sample the other delicacies from the altar. Nothing is permitted to remain behind, and anything not eaten is put into pockets or, in the case of the pig’s head, boxes, and taken away. The sesame cookie immediately starts sticking to the lining of my pocket, and I wonder momentarily what to do with the jujube stone in my hand, before surreptitiously dropping it under a bush. Throughout the ceremony, my attention had been divided between watching the rites themselves and turning round to look down over the Expo campus. I was staggered at the amount of progress that had been made since I had visited a year ago. Some of the organisers would later confess that actually, most of the progress had been made in the last three months. But if it had been rushed, that did not show. A hot, dry summer had enabled the construction to continue without rain delays, and the imminent approach of the immovable deadline had spurred the team to ever greater efforts. But I could not help but feel sorry for the labourers, because even now, when the worst of the summer is over, you would not want to be exerting yourself in the heat. Not sure what is next, I follow the official party to a two-storey pavilion, called the Dawon (다원), at the corner of the Gi Experience Village. We head upstairs for a refreshing cup of tea. I am seated next to the chief of police, who has excellent English. He assures me that his presence there is purely honorary, and there are no security concerns to worry about. There is a ceramics exhibition on the ground floor of the building. The police chief is clearly a connoisseur of ceramics, and opines that the work is not nearly as fine as that of my friend Kyung-sook, or of course of her teacher. But it is richly glazed with deep red colours and to my own untutored eye look like they will be an attractive addition to any display. I keep my counsel, not wishing to seem uncouth. Once the tea, rice cakes and other dainties are finished, the mayor departs to inspect the exhibition grounds, which are now stirring into life, to ensure they are ready for the first visitors. He looks around each of the stalls selling medicinal herbs, roots and other specialised products from the County. My own attention is caught by a stall selling naturally died fabrics: scarves, blankets and more. A beautifully waffled blanket in a delicate grey, dyed with charcoal, is particularly desirable (though I know my suitcase won’t be big enough to accommodate it once I accrue all the brochures and other materials I inevitably pick up on my travels). I also note down the indigo-dyed scarves as a potential gift for my wife Louise, for possible purchase later in the week. The craftsman who dyes the fabrics showed us his hands: his finger nails are permanently stained from his work. We shadow the mayor at a respectful distance, sampling the pine-needle alcohol at one stall and ginseng tea at another. By now it’s 10am, and the temperature is beginning to rise. We watch as the mayor pauses to inspect the map of the area we had just visited, installed on a wooden structure with its own Korean-style tiled roof. He pauses again at the gate through which you enter this section of the campus. The gate, known as the Gicheonmun (the Entrance of Heavenly Gi), opens into the central courtyard of the Gi Experience Village. 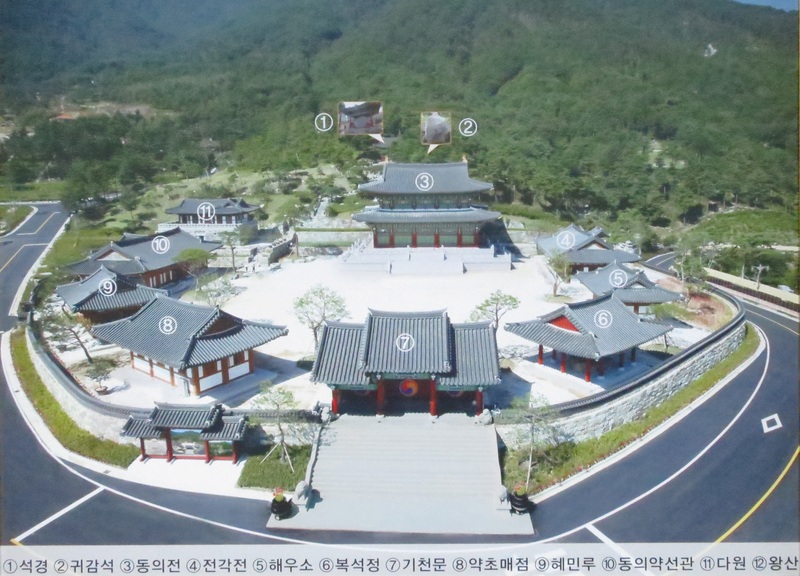 It has calligraphy by Park Chan-soo, the master carver and holder of intangible cultural property #1081, who has a museum in Sancheong County and who is often to be found at official county functions. On either side of the gate, guarding its entrance, are stone frogs furtively carrying a sack. They look as if they’ve just stolen something and are making their getaway. No-one could explain what the frogs were doing there, and a search of Korean cultural encyclopaedias will only reveal the fable of why a frog always sings when it rains. Perhaps it is a reference to the frog in the well in Korean and Chinese myth – the frog who was very contented in the limited confines of his well, but is so much happier once he is persuaded to leave his home and see the beauties of the world outside. So these frogs have had their eyes opened by the infusion of gi energy and are off on their journey fully invigorated. Or maybe someone just thought it would be nice to have some frogs there, because there were certainly other things in the expo campus which could not be linked to traditional medicine: I’m thinking particularly of the Dutch windmill which was perched up on the hillside without any particular purpose other than, well, someone thought it might look nice. Once the mayor has moved on, we wander past the frogs through the gate to take in the view of the main courtyard of the Gi Experience Village. The square is dominated by the Donguijeon, whose official English title is the Gi Experience Hall, though it is named after the Donguibogam. As you stand at the main gate, the hall obstructs your view of the Turtle Rock which is immediately behind it. But you can tell from the crowd of onlookers that it is there. Inside the Donguijeon, on the ground floor is an exhibition explaining some of the elements of gi, while upstairs you can meditate, have some tea, have a massage or simply enjoy the views over the valley and up to Pilbongsan peak. To the left of the Donguijeon as you stand with your back to the main gate are the two-storey Dawon where we had just had tea, a restaurant serving foods which feature medicinal herbs, and simple shaded pavilion for resting. To its right are the Jeongakjeon – the small hall where the Presidential Seal is made – and the third stone of the samseok trio, the Bokseokjeong (복석성 – the dish for happiness). This is situated in its own pavilion near the entrance to the courtyard. This stone is said to have magical powers which cure infertility. 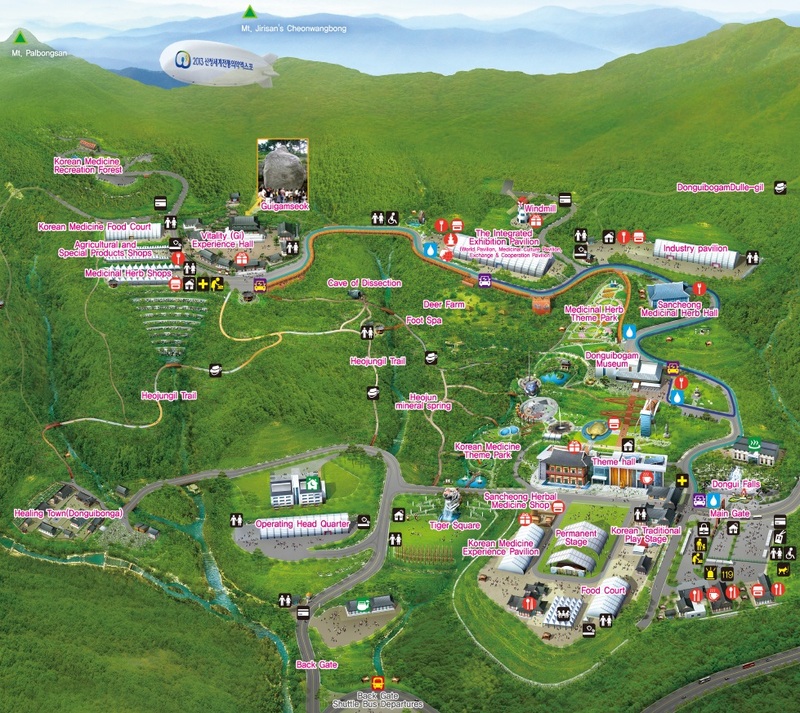 We stroll through the parkland along the wooded paths, detouring to take a look at the deer park on the slopes below the Gi Experience village. We walk along the foot spa trail, where visitors are encouraged to walk barefoot on a variety of uncomfortable-looking surfaces (pebbles, ridges, small logs and the like) before they can rest on one of the many tree stumps provided for them to bathe their feet in the cool water of a stream. Right now, there are no visitors – the Expo has not yet opened – but later on we would see every tree stump occupied. Alongside the path is planted a range of herbs including Siberian chrysanthemum, said to help discharge toxic chemicals from the body and replenish energy levels. 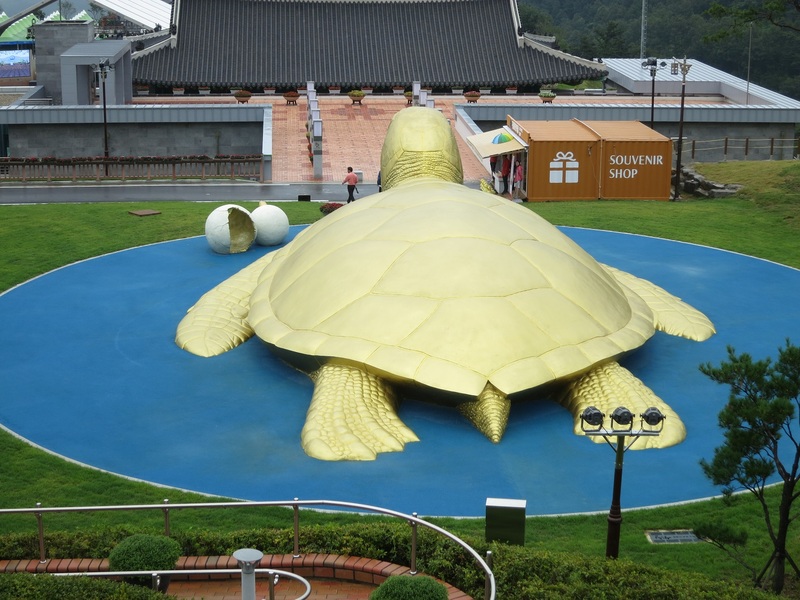 A giant golden turtle has been erected in the middle of the show ground – 20 metres from head to tail. Centrally placed between the two main museums on the campus (the “Theme Hall” and the “Donguibogam Museum”), it dominates the area, even upstaging the giant bear and tiger heads which had been there for a number of years. The animal signifies health and longevity, and the two recently-hatched baby turtles emerging from their eggs signified fertility, the next generation and the recurring cycle of life. The PA system, whose speakers reach into every corner of the Expo, has been playing jaunty music designed to lift the spirits on this muggy day. But suddenly the music is replaced by some ceremonial chanting which alerts us that the ritual to honour Yu Ui-tae is in progress. We hurry towards the statue of the learned doctor, to witness it. The ceremony is a duplicate of the earlier sanshin-je, but Yu Ui-tae is presented with fresh and dried fish instead of a pig’s head. He also gets some foil-wrapped candy along with the rice cakes and fruits. Immediately afterwards is the similar ceremony for Heo Jun. It’s still raining steadily, and little tarpaulin-covered shelters have been set up to allow the dignitaries to put on their ceremonial robes. The Mayor, who was excused from officiating at the Yu Ui-tae ceremony, is back to honour Heo Jun. He covers his cream-coloured hanbok with a blue court official’s robe complete with the square Joseon dynasty rank badge. It’s the sort of costume worn by the countless officials who take part in the Jongmyo rites that I witnessed three years previously, but here there are just three officials, each of whom offer a goblet of creamy rice wine before the ceremony is over. Watching the proceedings is a group of women in identical hanbok, wearing colour co-ordinated plastic anoraks over the top. Lined up, with their solemn expressions, they look like a church choir about to start the communion anthem. But there the similarity to a Christian ritual ends. As the locals pay their respects to a learned doctor from the past, I think of my own somewhat puritanical ancestors who will be turning in their graves at the thought of me witnessing a ceremony where men are prostrating themselves in front of not only a graven image but a pig’s head. And to add to the horror, the statues of both Heo Jun and Yu Ui-tae have been honoured with haloes, as if divinity is being ascribed to these mere mortals. But somehow, in a country which exports more Christian missionaries per head of population than any other, this ritual which a Christian would call pagan does not seem at all odd. The final ceremony over, we amble around some of the Expo pavilions and stalls, saying hello to friends from previous years, and in no particular hurry to be doing anything. We manage to bump in to Mr Min, one of the official Sancheong County guides who has shown me around in previous years. We also meet up with Mr Yoon, who went walking with us in the mountains last year, and exchange news with him. But we then receive a panicked phone call to tell us that the Mayor is awaiting our company for lunch. It was not the first time that day that we discover arrangements had been made without our knowledge. Being in a strange land, I like to know what is going to happen next, but I have learned to go with the flow. The lunch is a very tasty variant on shabeu-shabeu, in which boiling broth is brought to a table-top stove, in which you cook thinly sliced beef and vegetables. 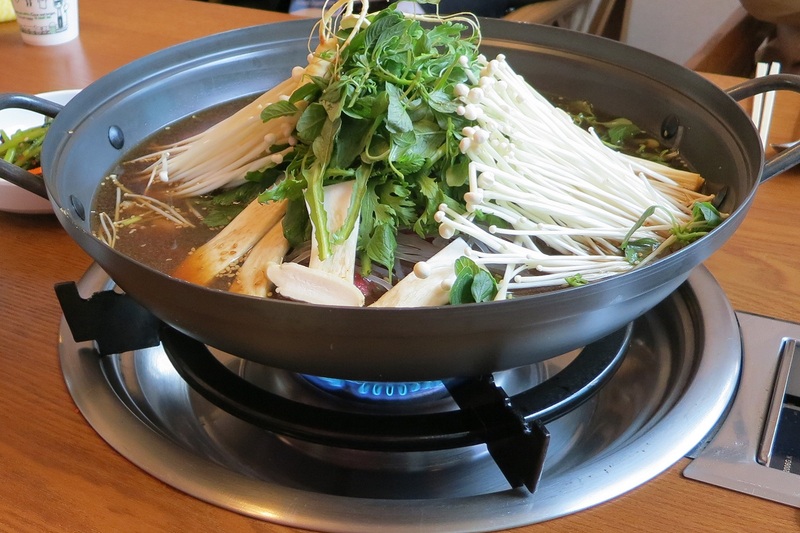 The broth is rich and sweet – with ginseng and other health giving herbs contributing to the flavour.